Our Air Seat Line Blow Gun Splicer Kit contains a grey nylon self-coiling air hose combined with a blow gun which is supplied with two nozzle tips; 1 standard and 1 safety nozzle. This kit allows you to splice into the air seat line and create your own air line for cleaning out the cab on-site. To install simply splice the air seat line and connect the compression tee in-line. 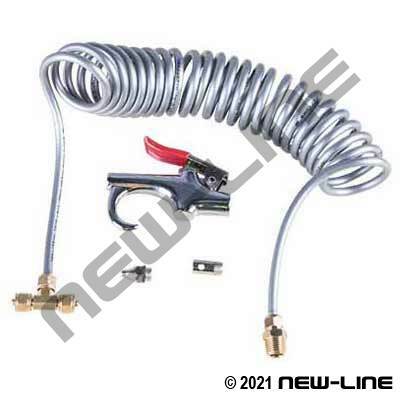 This hose is NOT for use as a DOT air brake hose, refer to our NL580 Series. Typical Fittings: Brass compression fittings (68). Construction: Permanently coiled nylon tubing.